Organic pear sales growth has slowed with sales actually falling nearly 5% in 2015 and rising nearly 4% in 2016. However, organic pears are still an important part of your produce mix, as they are nearly 7% of the pear category, and they are especially strong to promote in the fall. For more information on variety characteristics, visit our conventional pears page. Play up the growing practices surrounding organic pears. Let consumers know that pesticide use is decreased and growers focus on sustainability. As a fruit that is eaten with the skin on, this will appeal to consumers looking for the most environmentally responsible option. Pears are a versatile fruit making them a great option for cross-merchandising. Pears are often paired with cheese, so include organic pears in promotions of organic cheese to boost sales of both items. Pears are also popular baked. Include organic pears in promotions with organic baking goods. Other cross-merchandising opportunities include organic yogurt and organic bagged salad. Don’t forget organic pears during the winter holidays. They are a popular item in holiday desserts, so include them in holiday baking promotions. Lots of pear varieties are available as organics, including anjou, bartlett, bosc, comice, concorde and red bartlett. Include a variety of options in your display so consumers have plenty to choose from. Offer different varieties to learn what works best in your store. In peak season, display conventional pears and organic pears near each other to create a larger display. Organic pears can also be displayed next to organic apples as they are often associated with each other. Include breaking pears in your display. Breaking pears are treated with ethylene to make the color change. Stores displaying those breaking pears had 18% greater sales volume than those selling non-treated bartletts, according to the California Pear Advisory Board. Pears bruise easily so don’t dump organic pears on the display or stack more than two layers high. 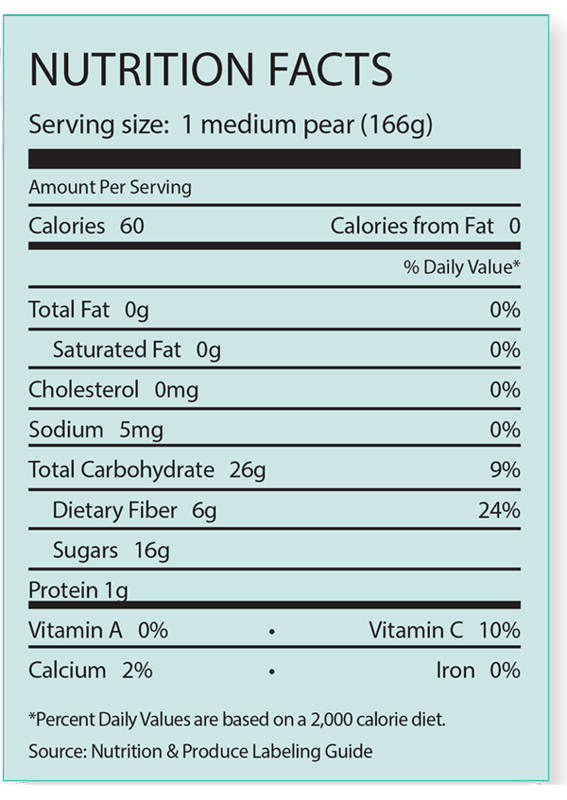 Organic pears are commonly shipped in 10- and 22-pound containers. Bartletts are often available in cartons of 12, 3-pound containers. Bartletts also are available in a variety of pack sizes, including custom packs. The best flavor and texture develop when pears are ripened off the tree. They are picked unripe, but mature. Fruit allowed to ripen on the tree develops a coarse, woody or gritty texture. Russeting is a common characteristic among some of the best-flavored pears. Scars or other minor skin blemishes usually do not affect eating quality. Bartletts will turn yellow and give off an aroma when ripe. Winter pears do not change color, and ripeness can be tested with a thumb. Retailers can set up pallet ripening programs in their back rooms. Cover pallets of green pears with canvas, which holds in heat and gas without causing the produce to sweat and deteriorate. Just 10% of consumers who purchased pears said they exclusively purchased organic pears. However, another 15% of those who bought pears said they purchased both conventional and organic pears.